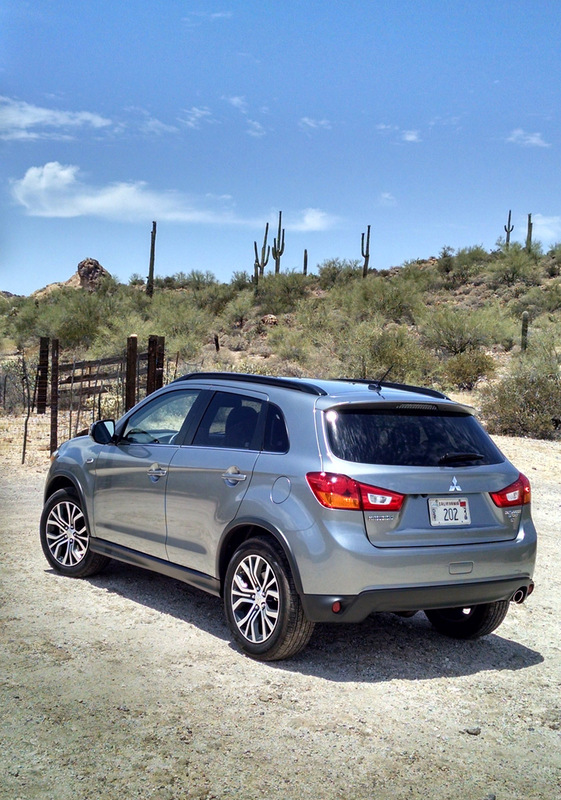 The Mitsubishi Outlander Sport is the top selling model for the Japanese brand, selling around 3,000 copies per month in the United States. 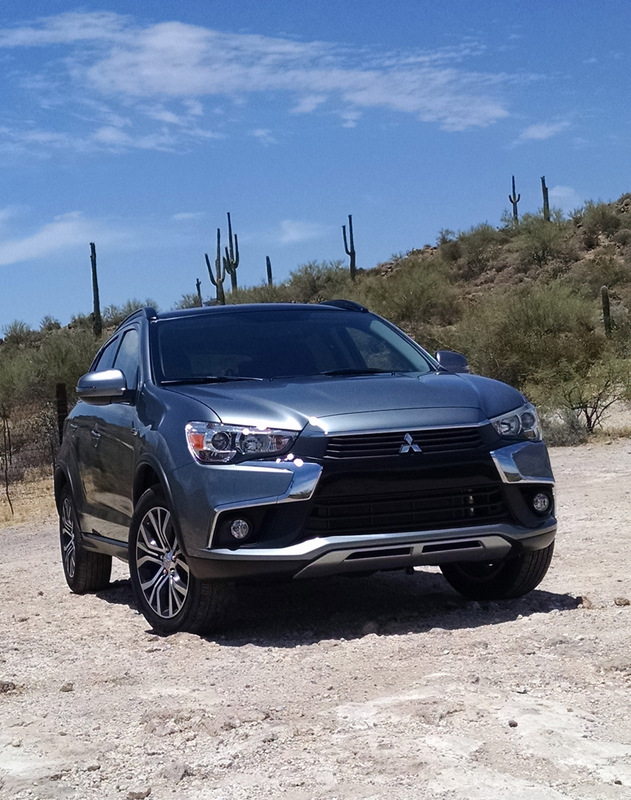 That’s good for Mitsubishi, but compared to compact crossover SUV’s from other brands, it’s at the back of the pack in sales. 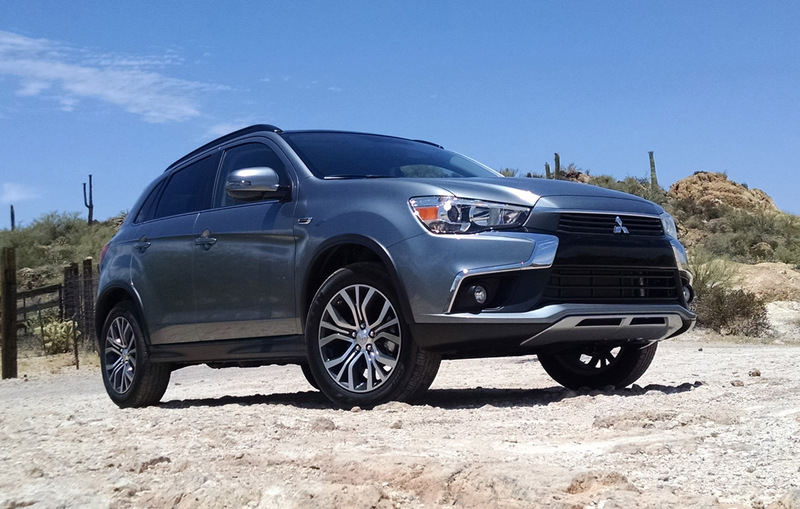 Mitsubishi has struggled since the Great Recession to modernize and update their product, but in the past couple of years has worked tirelessly to make what they have more appealing. 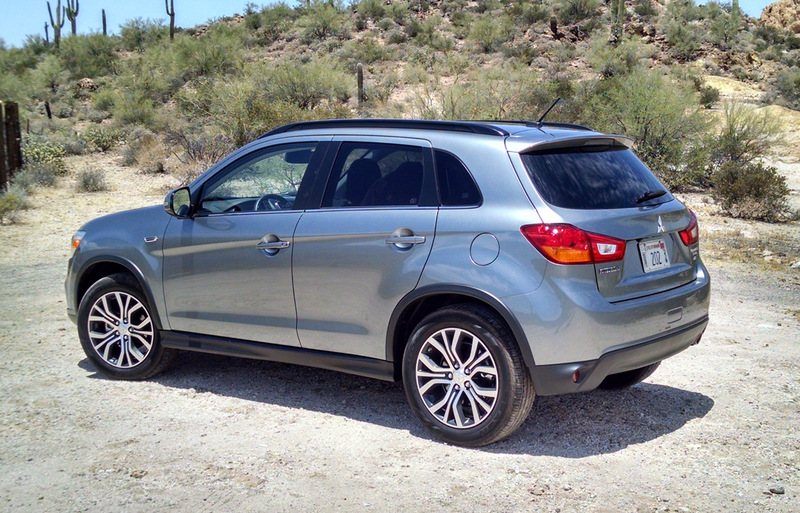 In that way the 2016 Outlander Sport received a number of updates to do exactly that. 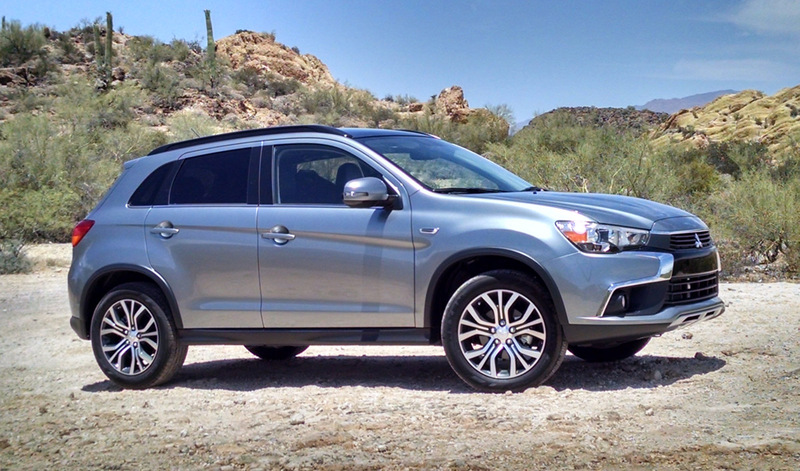 These start with a fresh look with the brand’s “Dynamic Shield” face lift. Heaping helpings of chrome and glossy black trim bring a decidedly more upmarket look to the crossover, as do handsome headlamps and a new 18-inch wheel design for upper trim grades. New power folding side mirrors with turn indicators and combination LED tail lamps also freshen the presentation of the exterior. 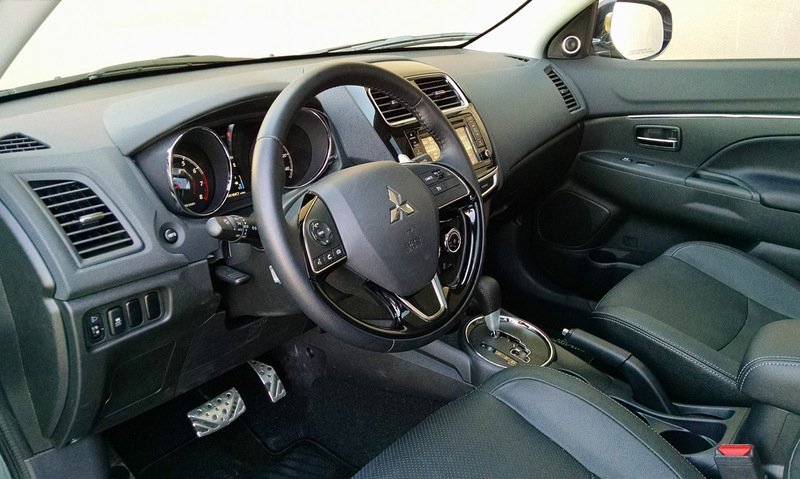 Inside, the cabin remains largely untouched with the exception of a new steering wheel design and a revised finish for the center stack of the dash. We found however that while the design is plainish, it feels of decent quality and had good fit and finish. 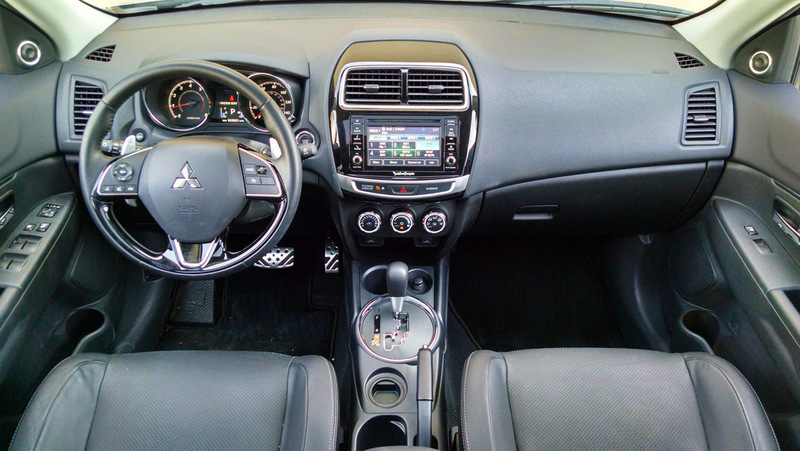 Its leather seats featured heaters up front and a power driver adjustment. The passenger makes due with manual controls however. In both chairs, we found them to be very stiff if not hard to sit on. Aside that they offered good range of adjustment and a good position. 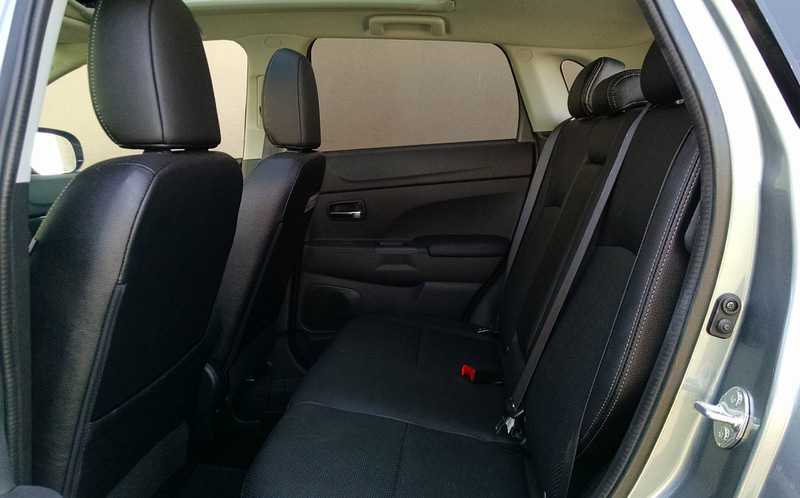 Rear seat passengers will find one of the smallest spaces in class. 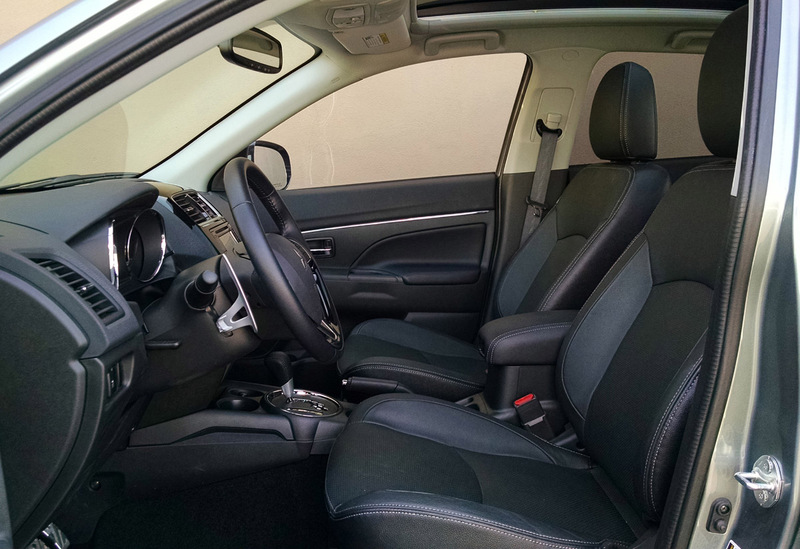 With the front seats half-way forward and back, leg room was at a precious minimum. The seating height and head room however was better than some in class. 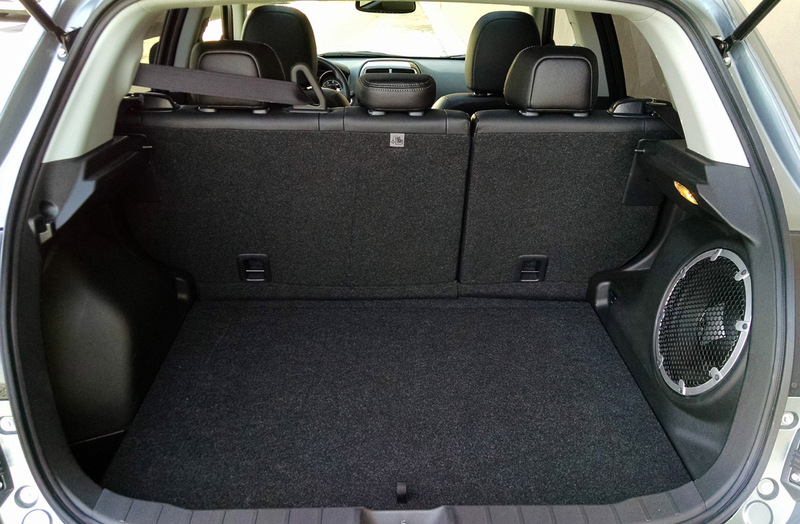 The rear cargo area features up to 49.5 cubic feet with the 60/40 split folding rear seats which are pretty easy to put down. They offer up a near flat load floor too, flatter than some in class. 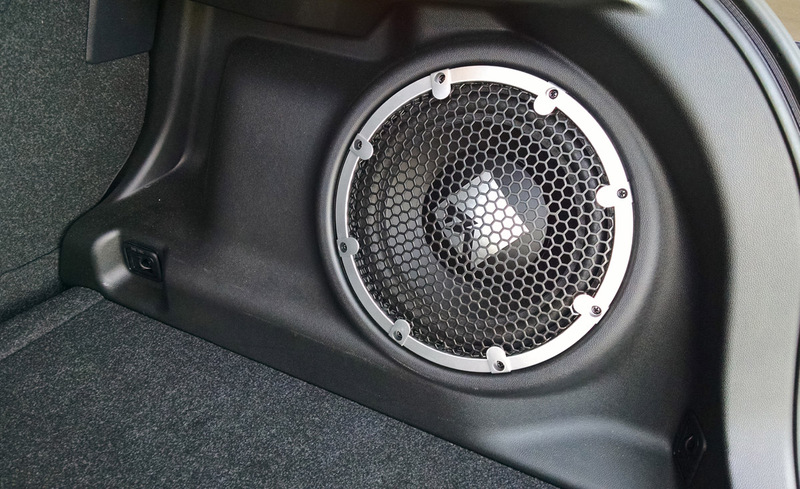 The only loss of space comes from the sub-woofer for the optioned Rockford Fosgate audio system. Under the floor is a full sized temporary spare tire, a good thing in a world where emergency inflators are replacing them. 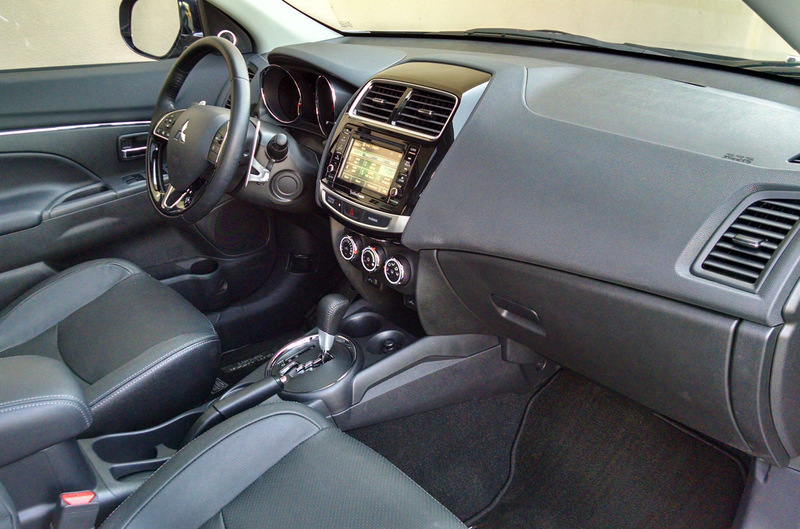 Our tester featured a well done but simple touchscreen audio system with Rockford Fosgate speaker and amplifier hardware. The menus were basic but the interface worked well and was easy to learn. Though it didn’t have a lot of the latest connectivity features and apps, the audio quality is near best in class if not the best. 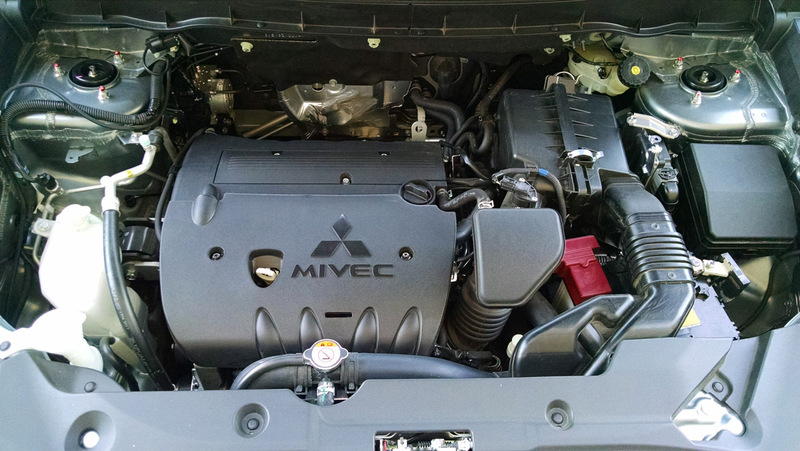 Under the hood of our Outlander Sport was the optional 2.4 liter MiVec four cylinder engine which offers 168 horsepower and 167 pound-feet of torque. 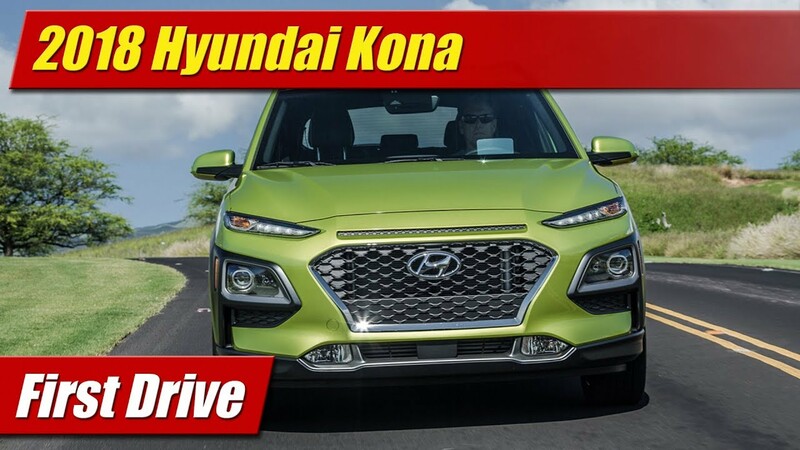 In our front-wheel drive test vehicle and with all-wheel drive it comes only with a continuously variable transmission or CVT. Power is competitive with the base engines in most competitors, though many of them offer even more for their optional engine. 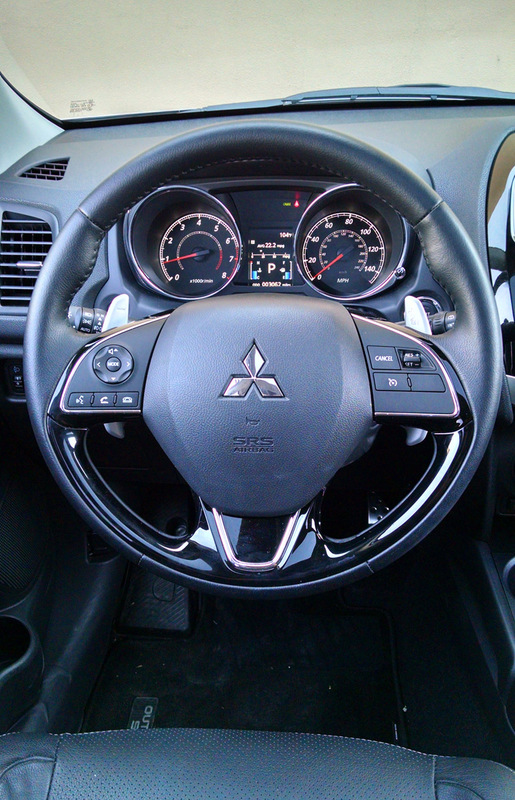 While we normally don’t care for a CVT much, this one had some rather convincing simulated shift points when using the steering wheel mounted paddle shifters. 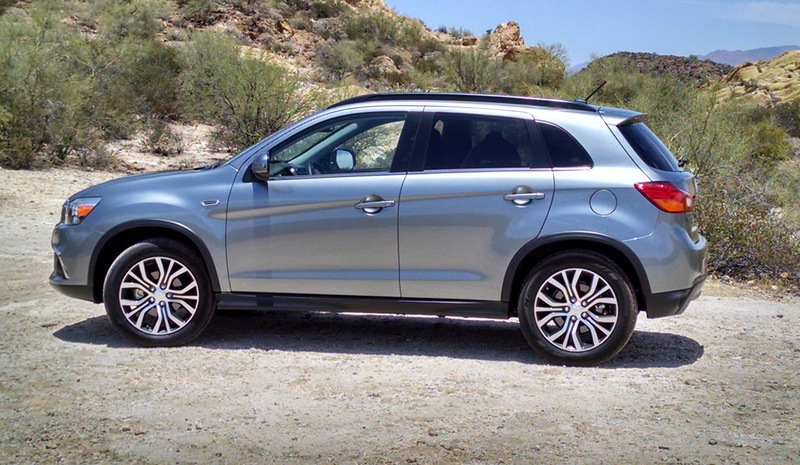 The powertrain was relatively quiet and didn’t have the thrashy and noisy persona that we remember from the past. 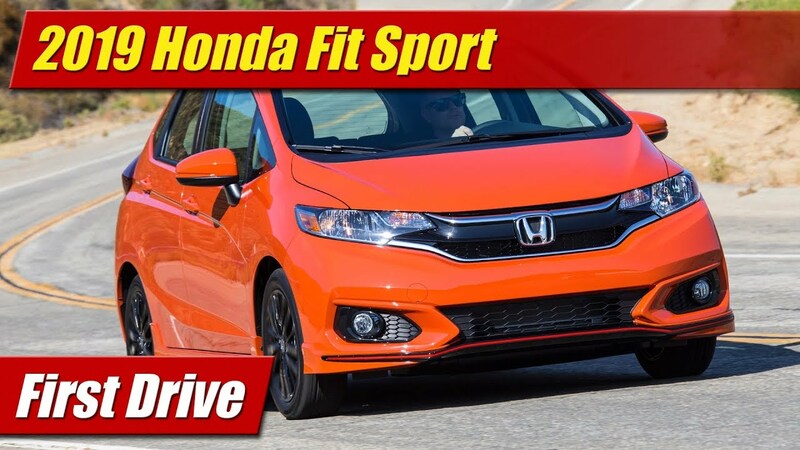 And even though the CVT could be grabby and abrupt in its take up from a stop, the overall outcome is one of reasonable refinement. 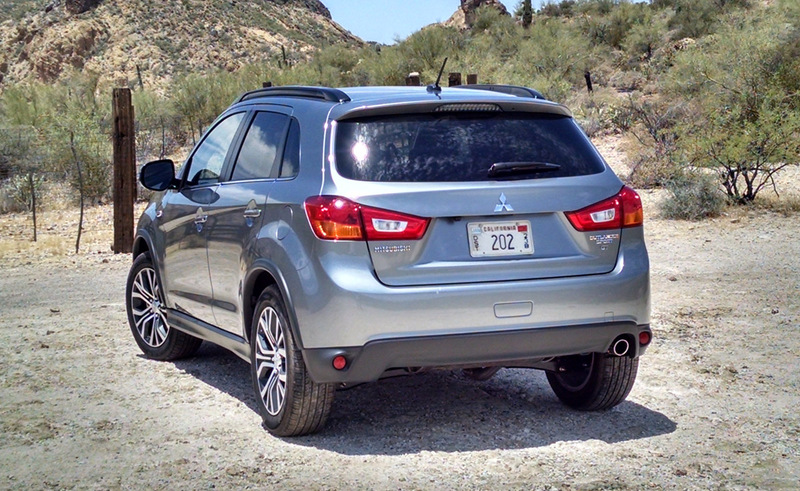 The ride down our favorite back roads comes across softer in its springs and damping rates than some in class. This contributed to a little bit of intermittent float at speed. 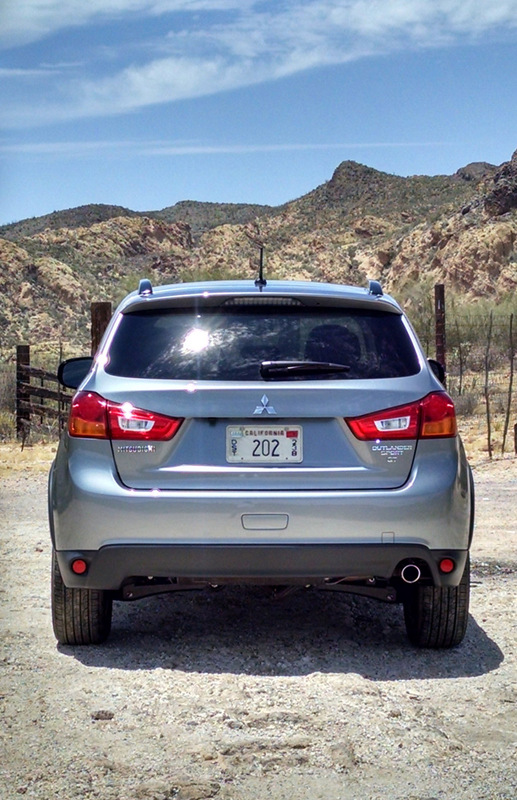 It did not however cause the Outlander Sport to feel top heavy in curves and in braking. 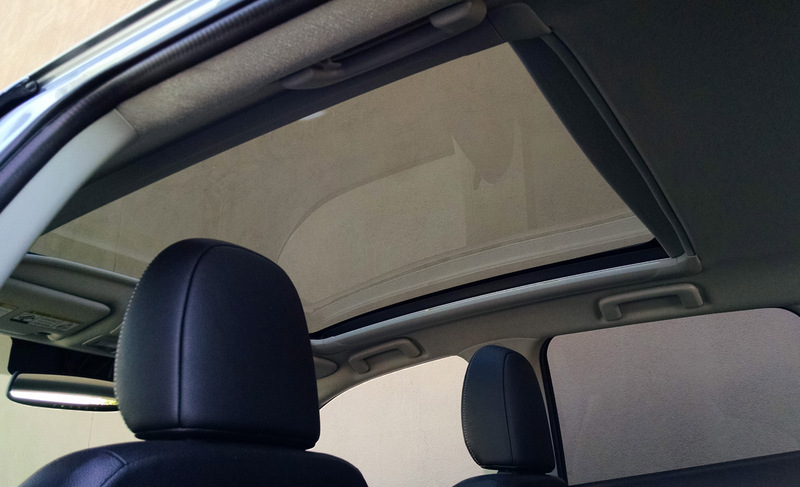 Road noise is at a minimum even with the panoramic roof with tire and wind noise well isolated. It’s off the pavement where that large glass roof and its headliner began to rattle and make itself known. 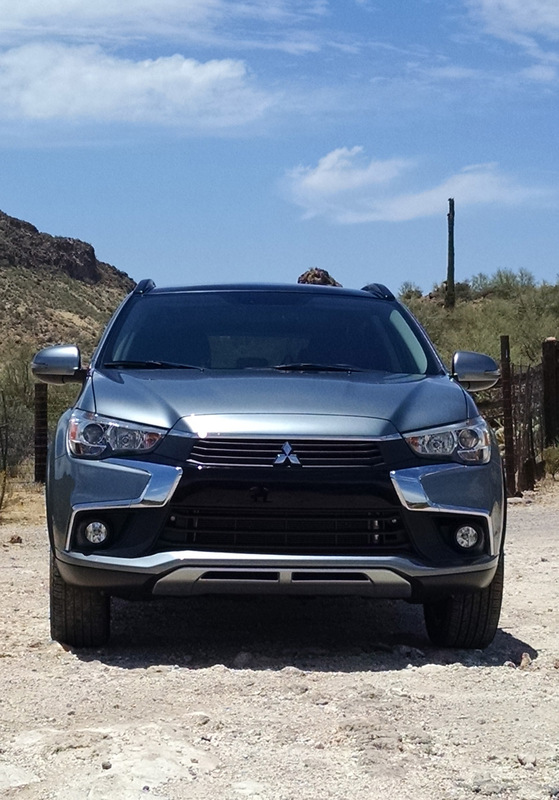 While the interior trims could not handle the washboard road’s vibrations, the chassis did a good job of feeling solid and free of shudders. Safety ratings for the Outlander Sport come in good for most tests of the IIHS with exception of the small-overlap crash where it only achieves an Acceptable rating. It is not a Top Safety pick as a result of this as well as its lack of an available crash prevention system. 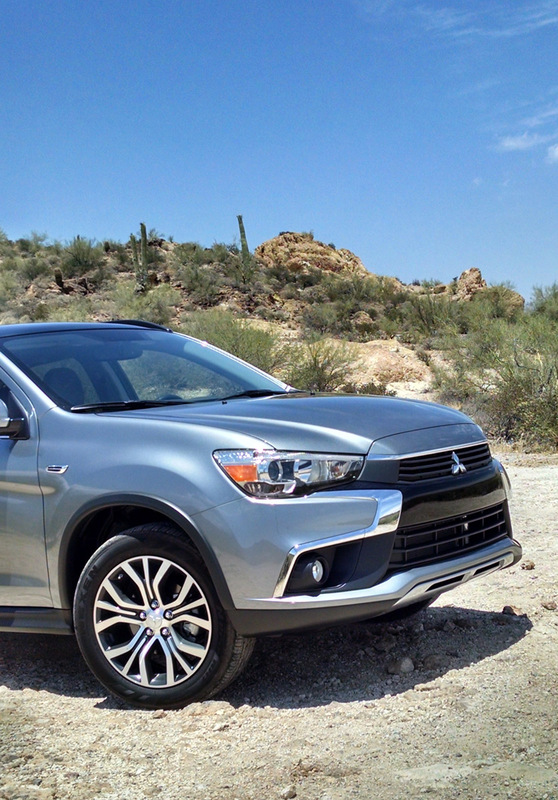 This Outlander Sport was assembled in Japan which as expected gives it excellent build quality. The paint finish was smooth, body panel alignments good, and the interior materials and fit quite excellent for its price of $26,890. Our final thought is that while it’s bottom of the class in sales volume, it isn’t bottom of the class in many of its attributes. If you want something simple yet well put together, and perhaps different than what the crowd drives, it’s worth a test drive.